Heavy Duty U Boat/ stock truck. 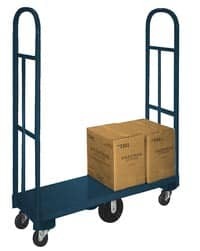 These Uboats have 8" center wheels and 4" swivel end casters. This U-boat is designed for use in supermarkets and liquor stores. Heavy Duty U-Boat stock truck for moving stock to sales floor. The metal deck and uprights are powder coated for extreme durability.